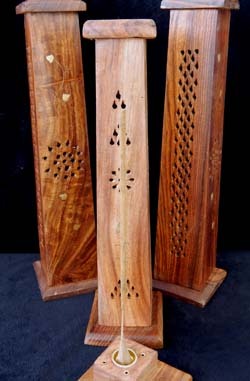 Smoking Wood Incense Tower - These 12" or 11" high wood smoking pillars will hold up to 4 sticks or 1 cone, incense sticks up to 10" or 9" long for best results. Very nice for burning 1 or more sticks at the same time. Sticks go into the bottom base and stand upright. 2 styles to choose from, 12" and 11", smaller tower (front pic) is $1.00 less in pull down menu. Style may vary slightly.